Chaplain Gregor - equipped with jump pack, bolt pistol, frag grenades, melta bombs, and the usual crozius arcanum and rosarius. Death Company (9 models) - Equipped with jump packs and usual array of close combat weapons. All Death Company also have frag grenades. 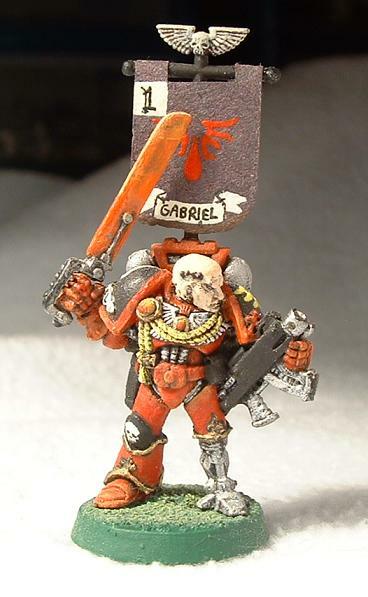 Tactical Squad Gabriel (10 models) - includes Veteran Sergeant Gabriel, who carries a power sword, plus a missile launcher and plasma gun. Tactical Squad Lysander (8 models) - includes Veteran Sergeant Lysander, who carries a power sword, plus a heavy bolter and meltagun. Two brothers succumbed to the Red Thirst. Attack Bike Squadron (1 model) - equipped with heavy bolter. Dreadnought Imperius - carrying a twin lascannon and power fist fitted with a storm bolter. Imperius also sports a Smoke Launcher. Devastator Squad Infernus (6 models) - includes a lascannon, plasma cannon, and two heavy bolters. Two brothers succumbed to the Red Thirst. Chaos Lord - riding a Juggernaut of Khorne and bearing an Axe of Khorne, plus wearing Chaos Armour. Plague Marines (10 models) - including a champion who carries the Plague Banner. The squad is also equipped with blight grenades and plague knives. Khorne Bezerkers (8 models) - armed with bolt pistols and chainswords. One model is carrying a plasma pistol instead of a bolt pistol. The squad is lead by a champion who has an Axe of Khorne. Havoc Squad (5 models) - including two lascannons and a heavy bolter. Dreadnought (1 crazed monstrosity) - armed with a plasma cannon and power scourge. We rolled "Patrol" for the mission. Sean picked the long board edge on the south side of the table to be his deployment zone, and dropped down a squad of five Chaos renegades with bolt guns. I took the north table edge, and dropped down Squad Gabriel. These were our "patrols." Realizing that the missile launcher from Squad Gabriel had a bead on his troops, Sean moved such that there were several buildings in between his forces and mine. With nothing to shoot at, I cautiously moved eastward. Since there was a gap between the ruins I began the game in and the nearest cover (a stand of trees), I was worried about my vulnerability should the Chaos reinforcements show up. The Chaos reinforcements showed up (doh!). On turn two, the Havoc Squad, Dreadnought, and Khorne Bezerkers arrived. The Havocs looked for a way to get off some shots at my guys while the Bezerkers followed the Chaos Marine squad as it marched inexorably towards my battle line. The heroic Blood Angels' reinforcements arrived... sort of... Squad Infernus and Dreadnought Imperius made a showing, as did the attack bike. I really needed to see my Death Company. Imperius took first blood by blasting one of the renegades with his twin lascannon. Since they had to move on from the edge of the board anyway, I rushed squad Infernus into the ruins opposite the enemy dreadnought, determined to shoot at him next turn. The dreaded Chaos Lord made his appearance, along with a group of Plague Marines. The whole Chaos army was now on the board, marching toward me. The dreadnought blasted Squad Infernus with its plasma cannon, wounding the lascannon and both heavy bolter troops. I failed cover saves for all three models, and with their squad coherency disrupted, Squad Infernus would be spending the next round regrouping instead of shooting. The havoc squad, having found a nice place to set up, killed two models from Squad Gabriel with its lascannons. The chaplain was still busy picking his nose. At least Squad Lysander showed up. I figured I might be able to draw the dreadnought's fire with the attack bike. Such a powerful model with a high toughness and good save is a pretty tempting target for troops armed with plasma weapons. With that in mind, I drove the attack bike between Squad Gabriel and the enemy dreadnought. I moved the remnants of Squad Infernus into the ruins. During the shooting phase, the attack bike managed to kill one Bezerker with its heavy bolter. Imperius blasted another renegade with his lascannon, and Squad Gabriel killed two more with bolter fire. The last renegade failed his leadership check and began running for the hills. The Chaos forces shot back this time. The Bezerkers blasted the attack bike (one of them had a plasma pistol - doh!) and the dreadnought killed two more models from Squad Gabriel with his plasma cannon. The Chaos Lord advanced towards my center. I knew the Chaos Lord would be a real devil in close combat. With a toughness of 6, 3 wounds, 5 attacks, and a save of 2+, I figured my troops wouldn't have a prayer. My best chance was to push Imperius into the fray, as he would be largely invulnerable to the attacks of the chaos forces, and might hope to kill one or two per turn with his power fist. 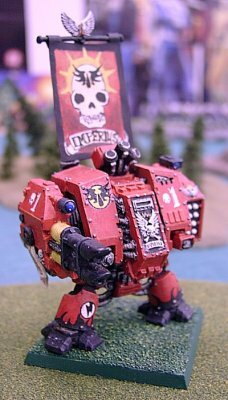 I had a bead on the chaos dreadnought with my own plasma cannon. I would probably hit, and I'd get a glancing blow on a 5, penetrate on a 6... at this point, I made a prediction: Squad Infernus would succumb to the Black Rage. Sure enough, I rolled a '1', and Squad Infernus shambled forward three inches to do battle with... well, nobody. The Death Company had finally arrived, and as much as I wanted them to move forward, they didn't. They scooted forward with their jump packs to shield Squad Infernus in the hope that I might get a shot off with the plasma cannon next turn. Imperius moved out into the open, but rather than shoot, I launched smoke grenades to prevent him from being shot to peices under the watching guns of the Havocs. The Bezerkers moved into assault range, and the enemy dreadnought strode forward. The Chaos Lord and the nearby Plague Marines started to get close enough for bolter fire, which worried me because I hadn't shot at them at all. The Havocs cut loose on Infernus, and despite my precaution of firing his smoke lunchers before breaking cover, one lascannon scored a glancing hit and destroyed Infernus by the roll of a '6'. In the assault phase, the Bezerkers surged forward. The champion killed one of mine with his Axe of Khorne, but due to poor rolling on his part and good rolling on my part, the only other casualty was one of his own men. Still, he won the "Moral High Ground," but thanks to Sergeant Gabriel's leadership of 9, we passed our morale check. I figured I could at least avenge my dreadnought. First, I moved up Squad Lysander and blasted the Plague Marines. The meltagun managed to torch one of them, but the rest of my fire was ineffective. The Death Company swooped in, engaging the Bezerkers man-to-man. My first objective was to take out that champion, so the Chaplain charged in. 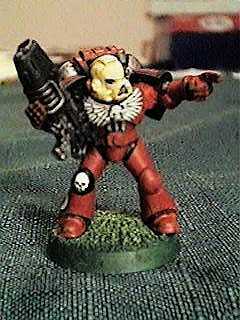 As a Blood Angel, when he charges, his initiative is a 6 and he has a strength of 5, plus the crozius arcanum counts as a power weapon. In the ensuing melee, I killed the champion and one other Bezerker, and took no losses. Since Khorne Bezerkers don't take morale checks, however, the combat was a draw and the rest of the Death Company moved up in the consolidation phase. I rolled too low for random game length, however, and the game ended there. The Death Company can roll to ignore the effects of the Plague Banner, because it causes wounds, and is neither an "Instant Death" attack nor is it a close combat weapon that ignores armour (like a power fist or power sword). This never came up during the game, but it surely would have had we played one more turn. The Death Company can not ignore the effect of a Plague Knife or Plague Sword, because they "kill the opponent outright;" i.e. the death they cause is not a death due to wounding, but is something more sinister. They could, however, ignore a wound caused by a Plague Knife or Plague Sword that failed to kill them outright.